How to Price the Unpriceable?? I got my books home and discovered that my “dirty” book was worse than I thought. It had a stamp along the top page edges “Public Library, Mill Valley” and a tiny stamp inside saying “GIFT.” (Darn, it’s ex-library.) But worse, I discovered a few interior stains and 3 pages that had thick black pen notations at the bottom. This was a book that had been read and appreciated. This is a book with personality. Now, books with personality can be hard sells and I almost tossed it on my Goodwill pile thinking it might not be worth my effort to sell…then I started doing some research. 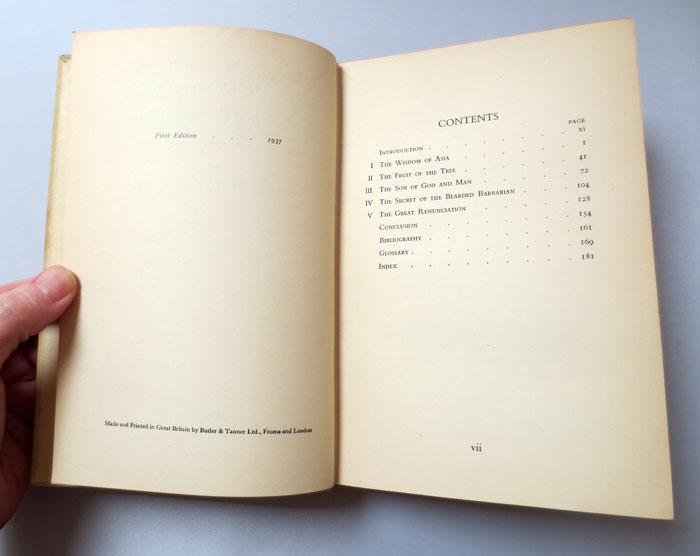 It’s a 1937, first edition “The Legacy of Asia and Western Man, A Study of the Middle Way” by famed Buddhist Alan W. Watts published in Great Britain…and nobody, but nobody has one currently for sale. Not on Amazon, Alibris, Ebay, Etsy, AbeBooks. I checked on Worthpoint.com and the only sale of this book title was for a 1938 University of Chicago version. Then I checked World Catalog, a site which allows you to find books in libraries. I figured if this book was in a lot of public libraries it probably wasn’t worth much. The nearest library that has a copy is the University of London! Some 5000 miles away. Well, now I’m stumped! This is starting to feel like a rare book. I’ve even tried to track down the print run information for this edition. Were 500 books printed or 5000 or?? So, right now this book is unpriceable! It could be priceless even in this condition. It could have been a gift from Alan Watts to the Mill Valley Library as he lived around there for a time. I just don’t know. Guess I have to dig deeper to figure this all out. 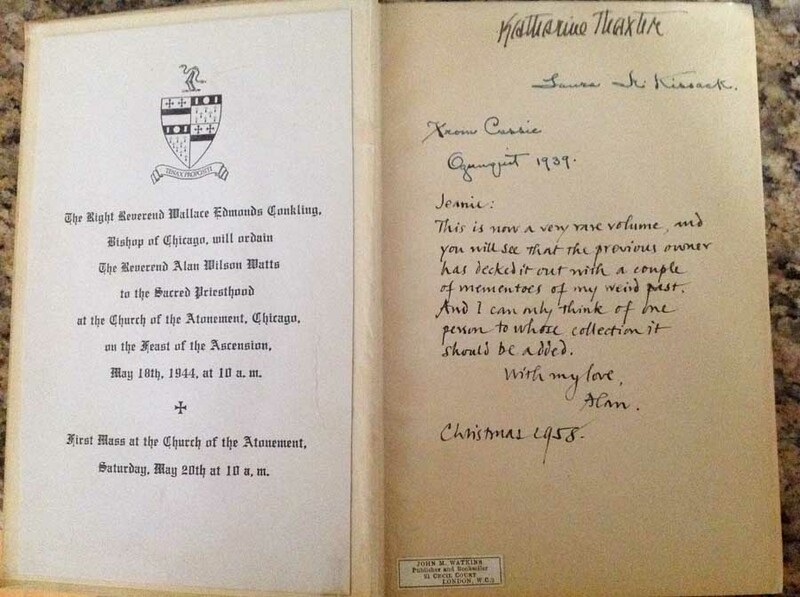 UPDATE 11/13/14: Reader Mike has the same 1937 book, but inscribed and signed by Alan Watts and given to his soulmate poet Jean Burden in 1958. In the inscription, Alan notes “this is now a very rare volume.” Fabulous find Mike! 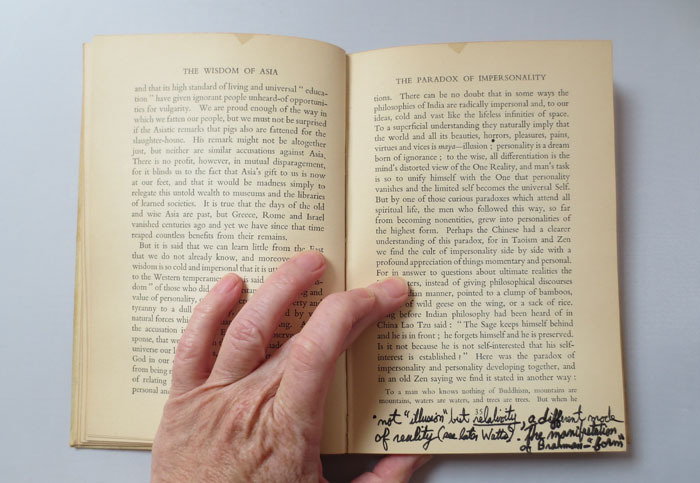 I have a first edition too…mine is signed and inscribed by Alan Watts . He has a wonderful hand. ← When is Stuff, Just Junk?